The idea of immersive theater tends to bring on expectations of fun and intrigue with promises of leaving present circumstances behind and allowing yourself to be somewhere else (possibly someone else or in some other time) for just a little while. But The Jungle is different. 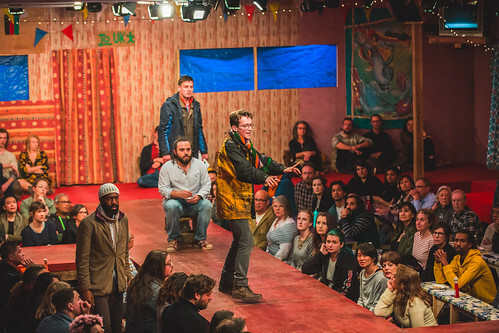 Written by Joe Murphy and Joe Robertson, the play is based on their experience as volunteers and theater-makers at the Calais refugee encampment that came to be known as The Jungle in its nearly two years of existence in 2015 and 2016. At its height, more than 8,000 refugees from many nations – Syria, Libya, Iran, Iraq, Eritrea, Sudan to name a few – were living in what came to resemble a small city. All of them were there in the hope of reaching the UK, that not-so-distant land just across the English Channel, where, on a clear day, you could see the White Cliffs of Dover. To be immersed in such a camp, as we are in this intense theater experience, is a complicated thing. On a theatrical level, everything is top notch. Directors Stephen Daldry and Justin Martin skillfully orchestrate chaos, danger, horror and community building in a way that makes it feel real while still guiding us through character development and plot. The Curran has been completely transformed from its usual majesty into a plywood “café” where most of the audience members are sitting at small tables (the same tables that the actors use as their stage). Set designer Miriam Buether pays such attention to detail it’s almost alarming to re-emerge into the world of the Curran and San Francisco at intermission. 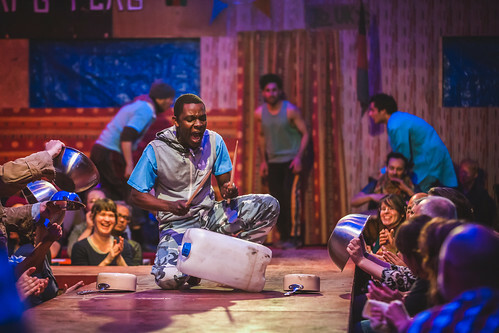 The cast, which includes people who actually spent time as refugees at the real Jungle, brings absolute intensity and commitment to making this realistic environment feel fully inhabited by real people, many of them desperate, scared and angry. We get a cross-sampling of refugees and their stories along with a handful of British volunteers who are trying to bring order to the chaos. There’s a lot of shouting, a lot of noise and mayhem as many things happen at once throughout the play’s two acts and nearly two hours. Theatrically, we’re in good hands (and that includes work by lighting designer Jon Clark, sound designer Paul Arditti and costume designer Catherine Kodicek), and that means we’re thoroughly immersed in this world where thousands of people (a small representation of refugees in a similar plight around the world) are reduced to a commodity that must be dealt with, ignored, taken advantage of, or, at worst, eliminated. Because we’re in the same room with them, experiencing slices of their hardships and challenges, we see them as what they are: people. Not blurbs in the news. Not data. Not the enemy. People. With so much news and so many politicized headlines inundating us from every angle (and with so much of it being bad news), we become inured to the reality of what people – so many of them families – are actually going through day to day just to survive. Amid the noise and bustle of the staging, a sense of intimacy is created, and we experience a vital connection with humans in crisis. What to do about that is almost as complicated as the crisis itself. The British volunteers are sometimes seen as interfering or working in their own best interests (not to mention escaping their own lives) as they attempt to find themselves in their good works. But with the governments of France and the United Kingdom doing so little, there’s a huge void and even more enormous need.